An optimum relative humidity for most pre-press, paper storage, and pressroom environments is 45-55%. Printers know that dry air causes the paper to lose its natural moisture, so it risks picking up static electricity resulting in wrinkling, losing register and causing paper feed jams. Proper humidity levels in digital printing production areas are necessary for optimum equipment performance, print quality, and problem-free media feeding. 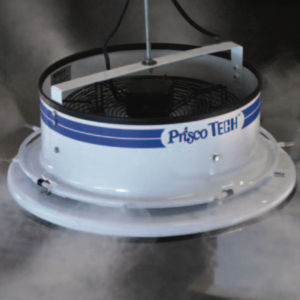 PriscoTech humidification systems improve the working environment, productivity and press utilization along with your product quality resulting in a positive impact on your profits. Our modular concept consists of several different misting head options which are combined with a high-pressure water pump and ICC controller for almost unlimited configuration possibilities. Water is atomized into micro-sized particles that are absorbed quickly into the air, ensuring the ultimate in humidity control. Our systems are designed for ease of installation and to be extremely resistant to dust or dirt. 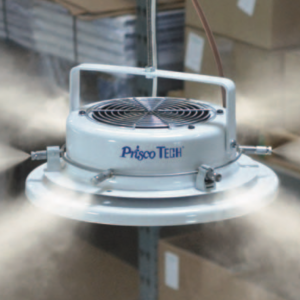 PriscoTech modular humidification systems direct the positive effects of humidity control where it’s needed most: in the pressroom, the bindery, paper storage and even your pre-press area! 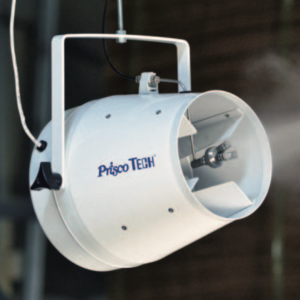 Precise humidification of any production environment can be accomplished by combining multiple ICCs, misting head types and custom configured high-pressure components. Each ICC controller is capable of maintaining precise humidity levels in one- or two-zones. 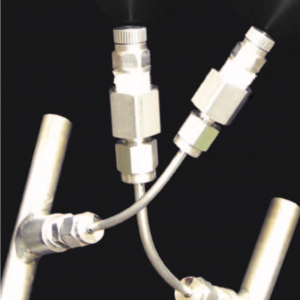 The high-pressure supply system can be configured for multi-zone applications supplying water to multiple misting heads.